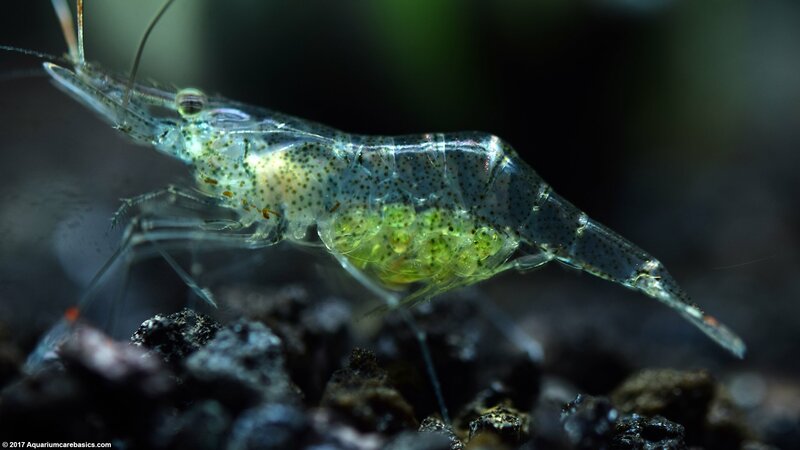 Ghost Shrimp, also known as Glass Shrimp, are relatively easy freshwater aquarium shrimp to keep. Ghost Shrimp are almost always available for sale at local pet stores as well as at the larger chain stores. At the pet shop, they are frequently kept in a small tank with other shrimp of their kind. The small tank often has a sponge filter or air stone pumping bubbles. On display, the Ghost Shrimp tank often does not look like something other than a tank of murky water with tons of bubbles. 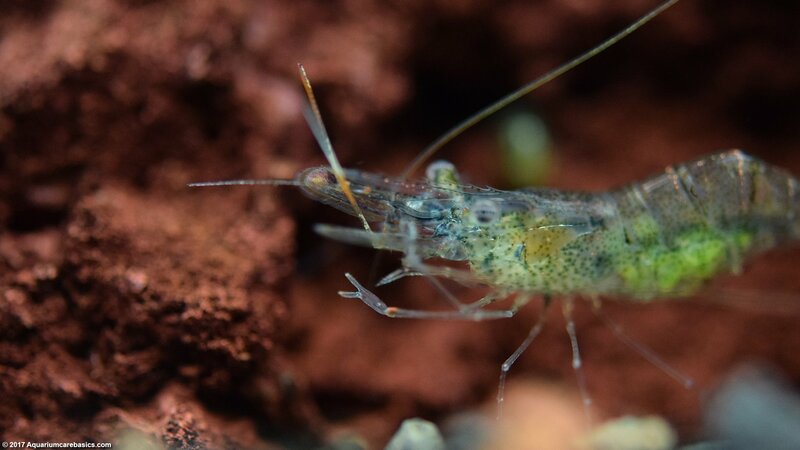 Ghost Shrimp are relatively inexpensive and are often purchased as “feeders” for larger more aggressive fish. Some Cichlids can eat Ghost Shrimp all day long. But Ghost Shrimp are more than a tasty snack. They are great aquarium cleaners and can be a lot of fun to watch. Many new hobbyists don’t give Ghost Shrimp a second look, but they really can be an interesting invertebrate to keep in their own right. 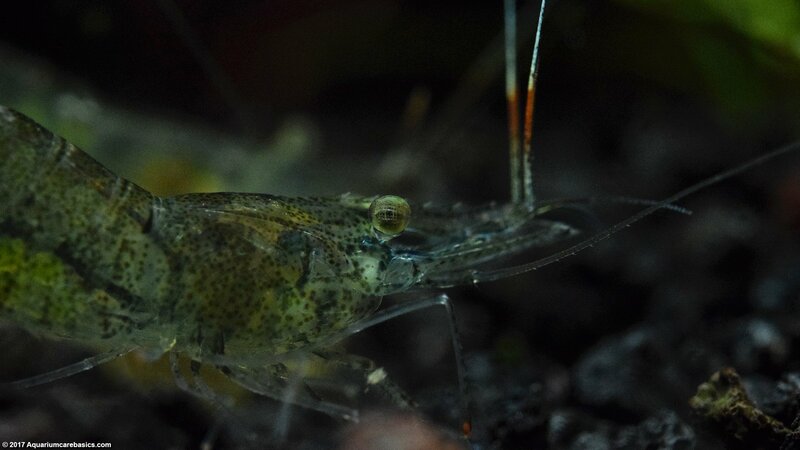 Ghost Shrimp look good when kept in a tank with black aquarium gravel or substrate. It’s also good to keep them in a tank with a black background. When the shrimp is up against the black gravel or background it makes them easier to see. 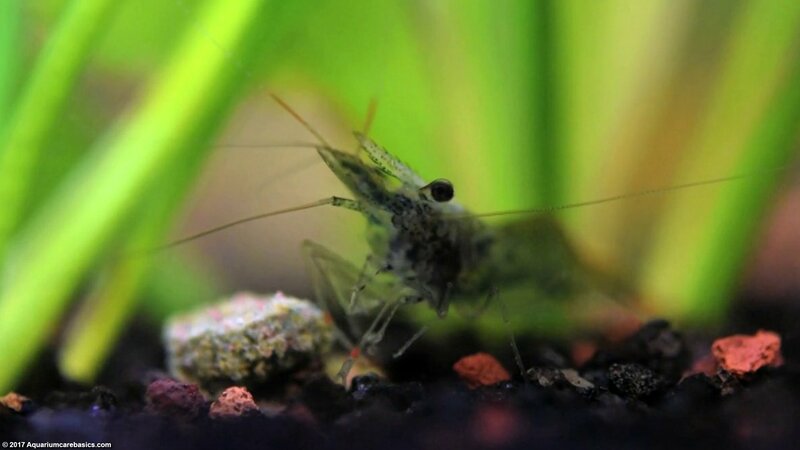 Ghost Shrimp care is relatively easy. They are very active and busy invertebrates tirelessly scouring the tank for food to eat. Always on the go, these shrimp are in their element when kept in an established tank that is not “too clean”. As scavengers, they search the gravel or substrate for little bits of edible material that is otherwise uneaten. 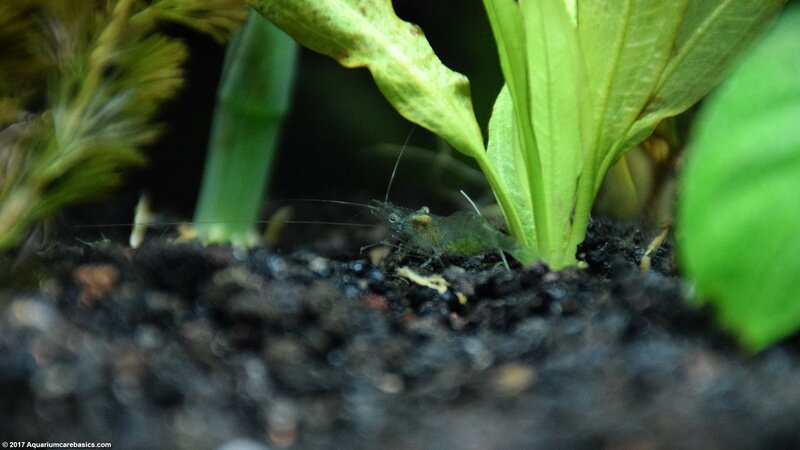 To that extent, Ghost Shrimp are decent aquarium cleaners, almost in the same league as Amano Shrimp and Nerite Snails. 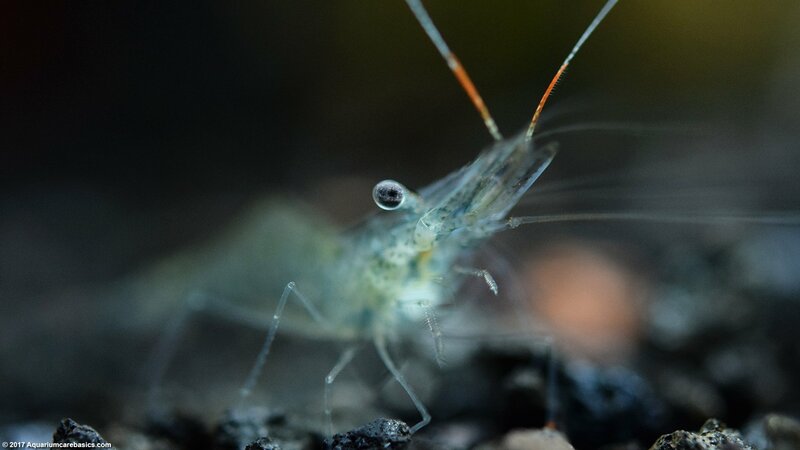 Ghost Shrimp are small so they may not eat as much as larger invertebrates, but they are constantly picking away at nearly everything they are near. Ghost Shrimp can be kept in small tanks like 5 or 10 gallon aquariums and larger. With small aquariums, be mindful of the limitations of the tank in terms of low water volume and limited surface area. So be sure to not accidentally overstock the tank. 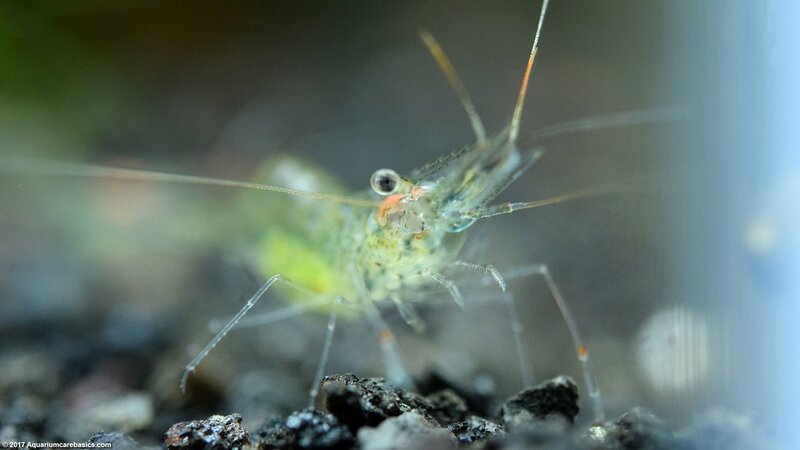 Ghost Shrimp are small creatures but they contribute to the bio-load of a tank just like other living organisms. Overstocking a small tank with lots of shrimp will cause water quality issues and can create an unhealthy environment. So follow the typical fish stocking rules for community tanks and things should work out fine. With small tanks like a 10 gallon, try not to add too many Ghost Shrimp. They may get aggressive and nasty toward each other if there are too many living together in a small space. Ghost Shrimp seem to enjoy establish planted aquariums with a moderate current of continuously moving water. An appropriately sized HOB power filter should do the trick and keep the water circulating properly. Additionally, an air pump with a fine air stone will create a wall of tiny bubbles to help keep water moving as well. With the bubbles, it’s fun to watch the shrimp get drawn up into the current and have to move their hind legs ferociously to swim out of it. Ghost Shrimp are great swimmers. 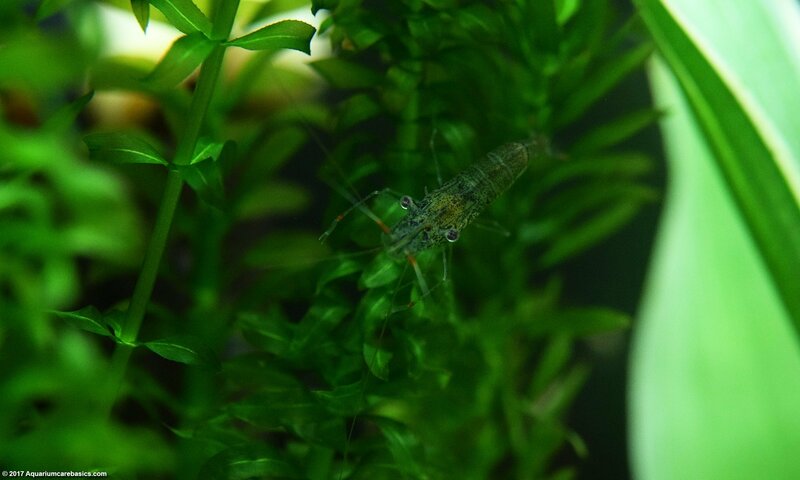 Keeping Ghost Shrimp in a tank with hardy live plants can also be a good idea. Aquariums with lots of live plants are never “too clean” as the plants constantly shed plant matter into the water column. 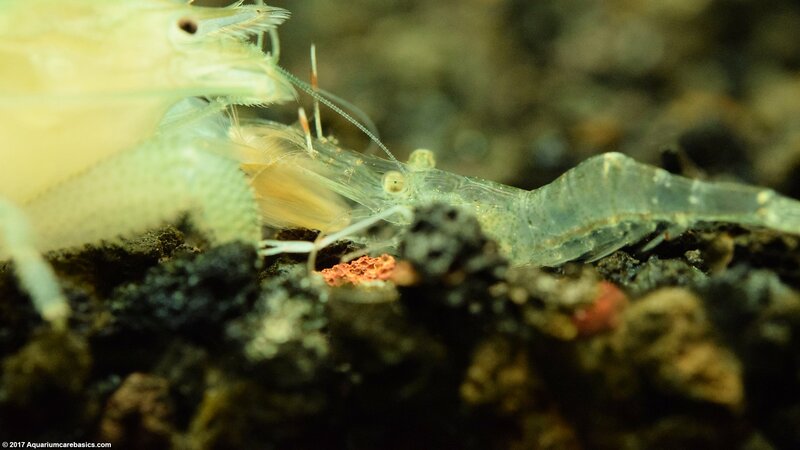 Ghost Shrimp seem to enjoy picking through the messiness and feasting on the parts they can eat. Keeping aquarium plants is also a good idea because they provide little places to explore and hide especially near the bottom of the tank. Other hiding places can be created with decorations or rocks built into caves and caverns. Either way, it’s important that Ghost Shrimp have places to sneak away to from time to time. As far as water parameters go, Ghost Shrimp seem to be comfortable in the tropical community tank range. Water temperature can be 72 – 82 degrees Fahrenheit, with some suggesting that a slightly wider temperature range is also acceptable. Aquarium pH should be fine anywhere between 7.0 and 8.0 provided there are no sudden shifts, and the water should also be on the hard side. Standard aquarium lighting will do. And as with all freshwater aquarium shrimp, be very careful when treating the tank with medicines. Keep Ammonia, Nitrites and Nitrates in check. And most importantly, avoid copper as copper can be fatal to aquarium shrimp. Ghost Shrimp food is broad as they will eat almost anything. They are great pickers and will eat like machines. Ghost Shrimp food can include some forms of algae, dead plant latter and detritus. 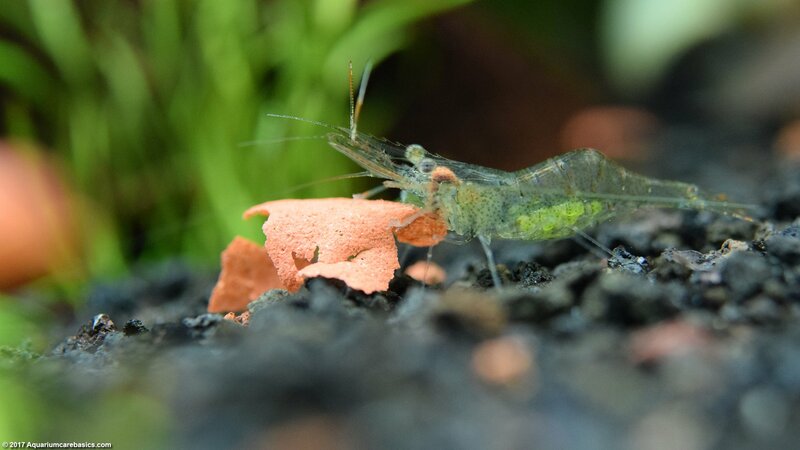 These shrimp love fish or shrimp pellets, fish flakes, algae wafers or bits otherwise uneaten food. And its a good idea to find food supplements with Calcium, as Calcium is necessary for healthy shell growth. Ghost Shrimp food may also include their fallen tank mates, as they will even feed off dead fish or dead shrimp. Of course, it’s important to take dead inhabitants out of the water quickly otherwise there can be an ammonia spike in the tank. It’s fun to watch Ghost Shrimp swim up and pluck bits of food out of the water. And there is a pecking order with feeding as well. Bigger shrimp eat first. Ghost Shrimp size varies by age, but generally they grow to be about 1 1/2 inches in length. In terms of width, Ghost Shrimp size is generally about the diameter of a pencil eraser when fully grown. 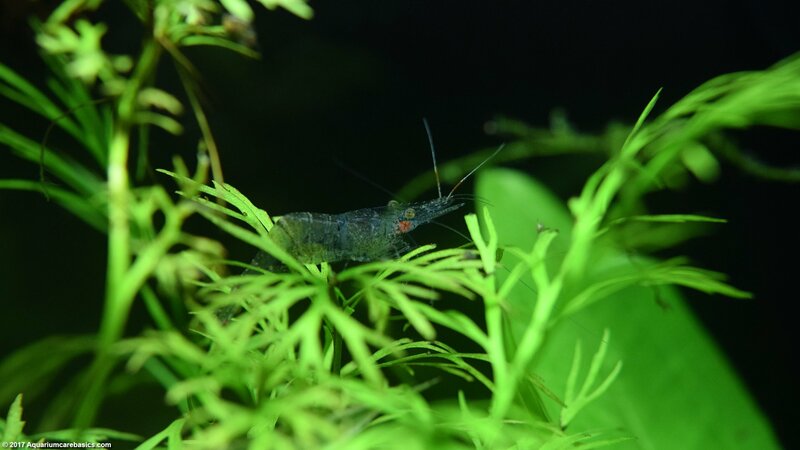 Ghost Shrimp tend to be thinner and more streamline as compared to Amano Shrimp. Ghost Shrimp have a little hump midway down the length of their tail. And like other shrimp, they resemble small crayfish. But there are some differences. One big difference is the size of the creature and the pliability of their shell. 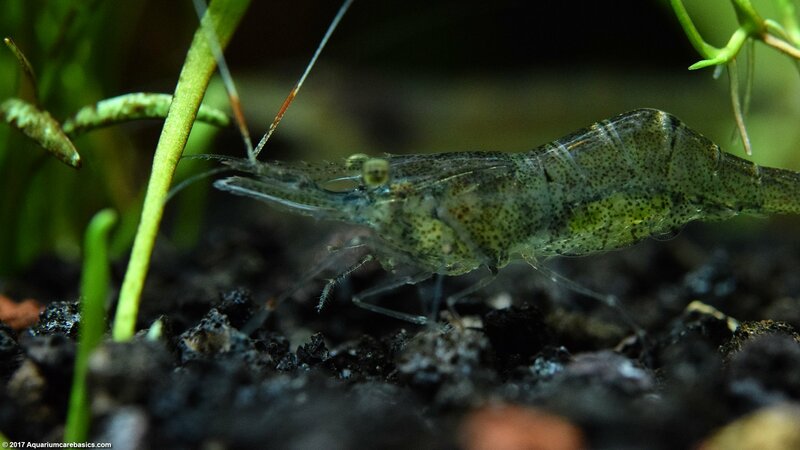 Glass Shrimp have much softer shells than crayfish. A Ghost Shrimp has a pair of long antenna and a pair of short antenna. Their rostrum is on the top of their head right between their eyes. Behind the rostrum is a carapace area. Its in this carapace area where many of the inner workings of this shrimp can be seen, especially when feeding. The shrimp’s front legs are attached to the underside of the carapace. The legs are long, slender and clear. When the shrimp is feeding on the tank bottom or on hard surfaces, its primary method of movement is to walk with its legs. Behind the carapace, they have six abdominal segments that form a flexible covering. The area between the third and fourth abdominal segments comes together to form what appears to be a slight pointed area that juts up slightly higher than the other segments. Little clear swimmerets are tucked under the abdominal segments. These swimmerets can be seen fluttering back and forth as the shrimp moves up and down through the water column. And female shrimp keep their eggs safely tucked under the abdominal segments closest to the carapace. The sixth abdominal segment connects to the tail. The tail is also made up of flexible, moving segments. But these segments are thin and flat. In the middle of the tail is the telson. Under the telson are the four segments of soft shell that make up the uropod. The uropod can expand and contrast slightly to make the tail more broad or more narrow as need be. And on the edges of the uropod segments, the shrimp has very fine filament-like “fringe”. Similar looking “fringe” filaments also appear on the edges of the swimmerets. When the shrimp needs to move very quickly, in case of danger, it can be seen becoming very streamline and quickly flapping its uropod under its abdomen. This causes the shrimp to propel itself backwards at very high speeds. Often, one quick thrust backward is sufficient to get out of dangerous situations like conflicts over a piece of food. But it’s not uncommon for them to pump their uropod a couple times in a row to put some real distance between themselves and danger. When this happens, the shrimp can end up retreating to other side of the tank in an instant. 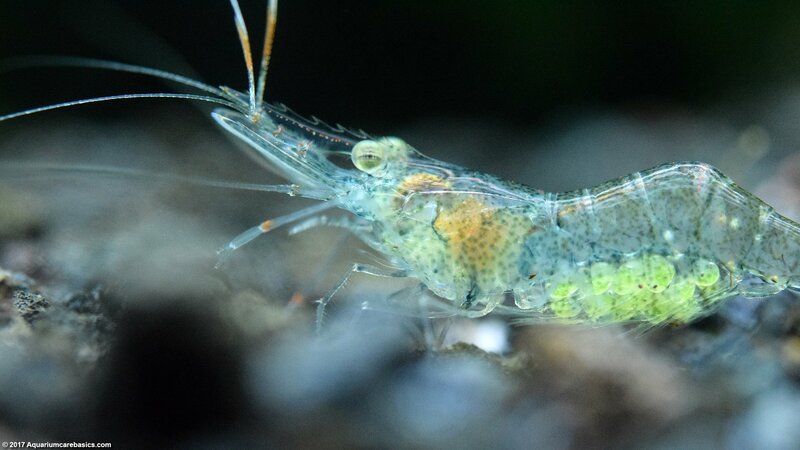 Many people describe Ghost Shrimp color as a transparent shrimp, but I think they are more on the translucent side. Their bodies are generally clear with a hint of hazy grey, or sprinkled with green dots. 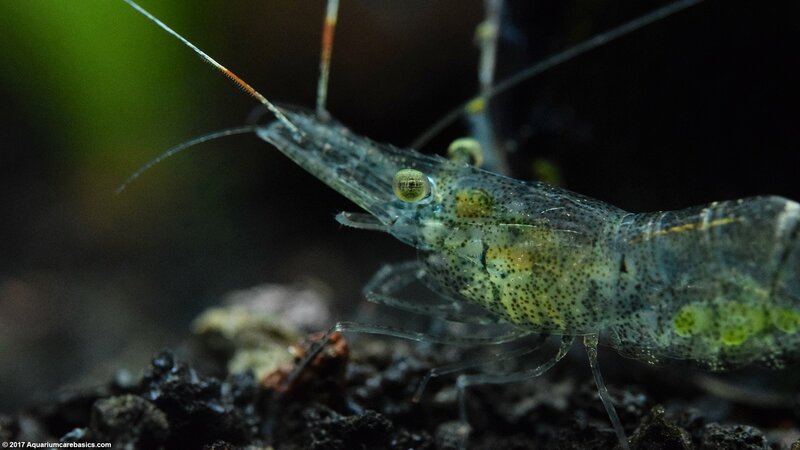 Ghost Shrimp color ranges from translucent light grey to a translucent darker grey, but in either case one can see almost see through the shrimp, and certainly can see inside the shrimp. And that is one of the most fascinating aspects of a Ghost Shrimp: One can see the internal workings of its body when it feeds. It’s really amazing to watch close up. They may also have little green dots on their torso, and orange rings on their feelers and front legs. 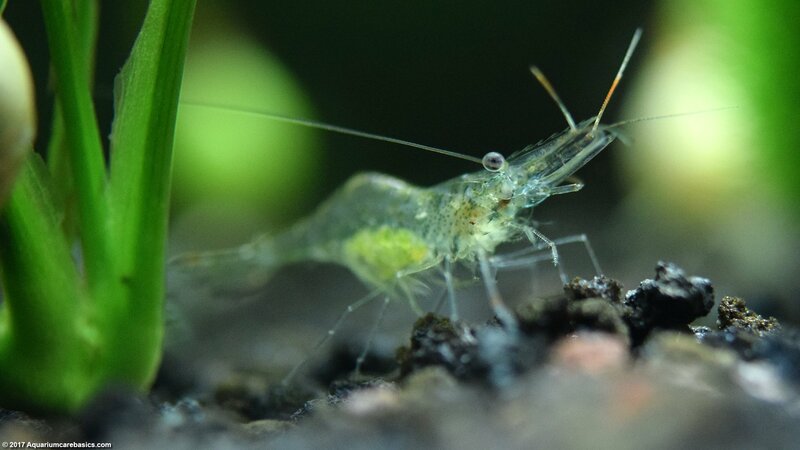 Ghost Shrimp lifespan can be anywhere from a couple of days to 1 year. 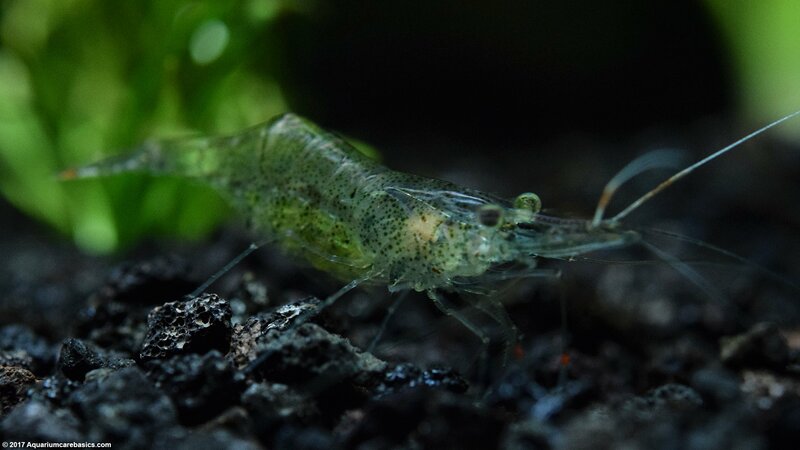 In some cases under good conditions and with a little luck, a Ghost Shrimp lifespan can be a little longer than a year. But usually not that much more that that. 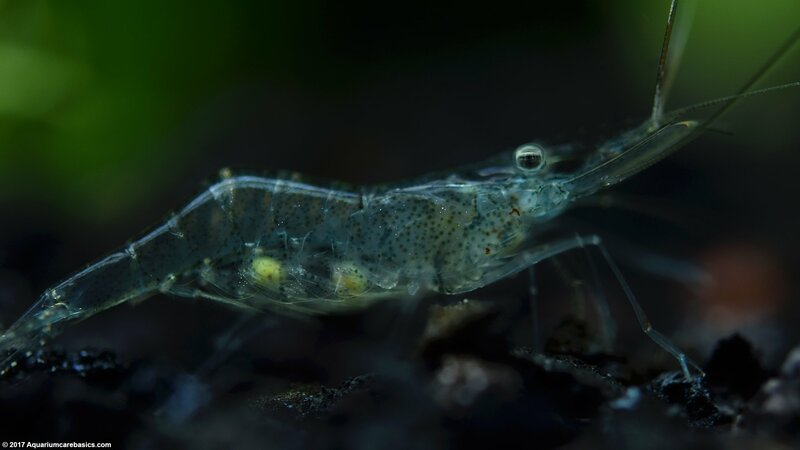 Ghost Shrimp are at risk of dying soon after they are added to a tank. 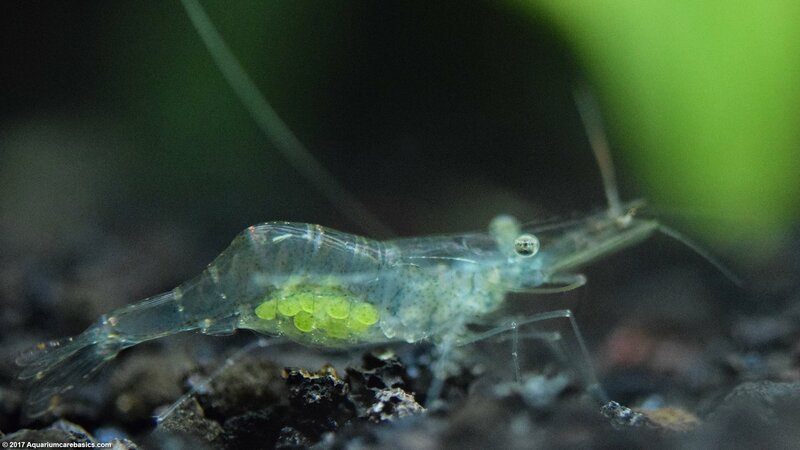 It’s not uncommon for Ghost Shrimp to die within a day or two of being introduced to an established tank with healthy and stable water. Some will appear dead on the bottom of the tank and others will simply “disappear”. At the same time, other Ghost Shrimp from the same batch acclimate well and thrive in their new environment. Maybe its the stress of being brought home from the store, or maybe they experience stress due to very slight differences in water parameters, but whatever the reason be prepared to lose a few shrimp with each batch. Another consideration is that because these shrimp are considered “feeders” they may not be treated very well when transported to the store. They are often kept in overstocked, under-filtered tanks with poor water conditions. That may be why some are prone to dying when transported to a home aquarium. Ghost Shrimp are often kept in groups. It’s difficult to say how often Ghost Shrimp molt because its hard to figure out which of the group has lost its shell. Most commonly a hobbyist will wake up one morning, check out the tank and see a couple of clear white empty shells on the bottom. As long as they shrimp are there, all is good. 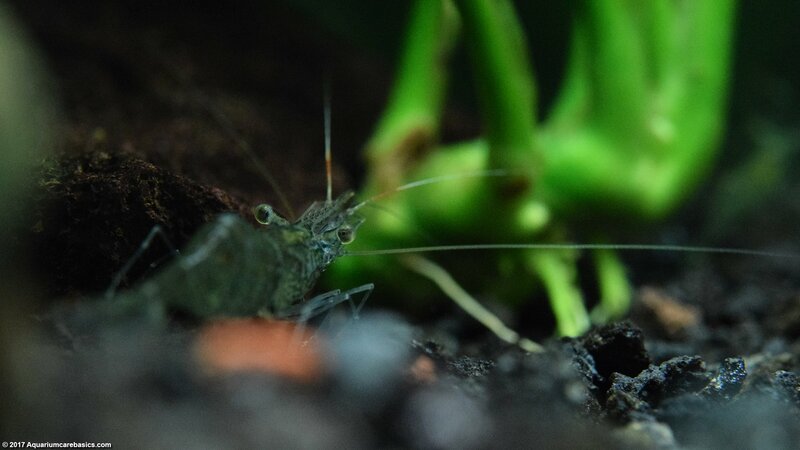 The important thing to know is that Ghost Shrimp molt as they eat and grow. So as long they are actively feeding and moving about, it’s normal for them to molt often. Molting just means they are healthy and growing larger. When Ghost Shrimp molt they are very vulnerable until they get acclimated in their new shell. That’s why its important to keep them in a tank with lots of small hiding places. Live aquarium plants are good for this purpose. After molting occurs, leave the empty shed shell in the tank for a few days. Other shrimp may take turns feeding off it. Re-ingesting the minerals in the old shell helps set up their next molting cycle. Ghost Shrimp tank mates can be small non-aggressive community tank fish that are not large enough to eat them. They are not going to last long (meaning a matter of seconds) with Goldfish, Oscars and other cichlids, Frogs, Turtles, crayfish or other aggressive roughens. Good tank mates for Glass Shrimp can include others of their kind, as well as: Bamboo Shrimp (aka Wood Shrimp), Vampire Shrimp (aka Viper Shrimp), Amano Shrimp, provided the Amanos are larger, Red Cherry Shrimp, Nerite Snails, Mystery Snails, Malaysian Trumpet Snails, Gold Inca Snails, Ivory Snails, and Ramshorn Snails. Ghost Shrimp can also be tank mates with some calm and peaceful community tank fish especially Cory Catfish and Otocinclus Catfish. As always, check with the clerk at the pet store about potential compatibility issues before purchasing Ghost Shrimp and adding them to a tank. Ghost Shrimp breeding is challenging. 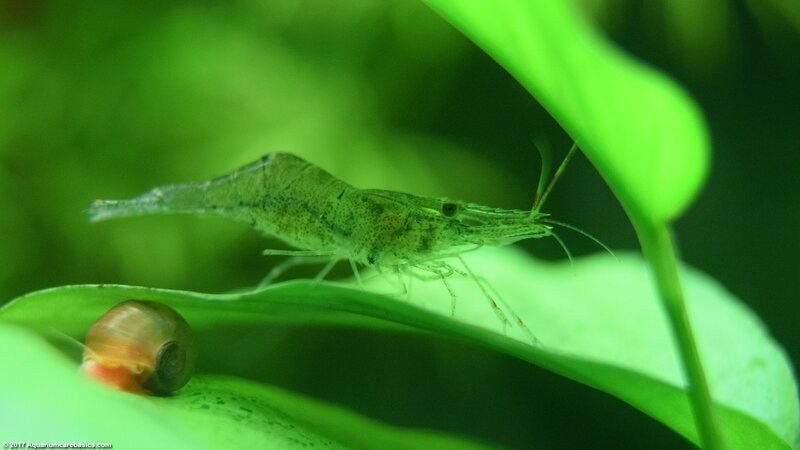 I have kept Ghost Shrimp berried, or with eggs, but I have never been successful reaching the stage where I’ve seen live babies. This may be due to the fact that the shrimp have always been in busy tanks with tank mates that could be interested in eating the offspring. That said, they can reproduce in fresh water and can be purchased carrying eggs. So have some fine sponge filters handy to cover power filter intakes in case you see larvae. And it may be a good idea to move the berried shrimp to a separate tank so the baby shrimp do not get eaten by hungry predators when they are first born. If Glass Shrimp are going to be used as feeders, its not necessary for to keep them in an elaborate tank. Just about any size tank will do for this purpose. Gravel and live plants are not necessary either. Although some floating Anacharis may be useful in keeping the tank water somewhat healthy. One thing that should be present is a constant flow of air bubbles. Tiny air bubbles are necessary to keep the water moving and the surface area agitated. So a small air stone, a few feet of tubing and a small air pump are needed. If Glass Shrimp are going to be kept for any length of time, a small sponge filter would also be a good idea. Unfiltered feeder tank water has a tendency to get dingy, cloudy and yellow-looking pretty quickly. A sponge filter will act as a mechanical and biological filter, and the bubbles will keep the water moving. A corner sponge filter with a weighted bottom will work well. A small net should also be on the accessories list. Finally, its probably not necessary to keep the feeder tank heated or covered. But a hood or clear cover may be a good idea to limit splashing from the bubbles aerating the tank.